With inspired leadership, hard work, ingenuity, and vast spending, American efforts at space flight came to equal and exceed those of the Soviet Union. 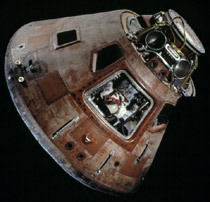 Astronauts reached the moon, and artificial satellites became a common tool of communications, mapping, and weather forecasting. Reforms in mathematics and science teaching had other consequences. Although funding for education became an accepted part of federal spending, many of the new curricula were short-lived, and many professional scientists and mathematicians soon withdrew from educational efforts below the college level. Nevertheless, for a time the number of students taking advanced courses in science and mathematics grew. Both the number of college graduates and the number of new doctorates in these areas increased into the 1970s. Then school enrollments began to decline, federal funds were diverted to wartime spending, and many of the young experts had difficulty finding jobs equal to their expectations. Discussions of reforming mathematics and science education continued, but not with the intensity, participation by professional scientists and mathematicians, and new curricula of the post-Sputnik years.